…Old Calabria, by Norman Douglas. First published in 1915, it remains the best book ever written on the toe of Italy’s boot, a vivid evocation of life, language, history, and customs of this ancient land. A brilliant observer, a scientific humanist, a true homo mediterraneus, Douglas knew everything about this region. …Ionia: A Quest, by Freya Stark. That’s Dame Freya Stark, one of the two great English Mid-East explorers (the other, Wilfred Thesiger), who lived 100 years, learned Persian and Arabic, and traveled into western Iran and southern Arabia before any non-Arab. 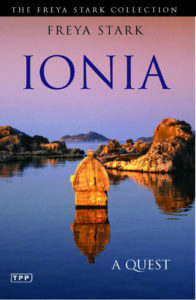 “Ionia,” an account of her 1952 travels through western Turkey, was one of three books resulting from her following in the steps of Alexander the Great. …Siren Land: A Celebration of Life in Southern Italy, by Norman Douglas. Again, Douglas, unsurpassed writing about this region, this time on the Bay of Naples and the island of Capri, where he died 55 years after first buying a villa in Naples. It was his first travel book, first published in 1911, and in many ways his best, showing on every page a wide and Gibbonian outlook. “Capri’s beauty, though vital and palpitating, is now cramped and impaired by the encroachments of humanity. Rocks are blasted away for driving roads; shrubs are cut down; high walls and houses everywhere invade its primitive comeliness.” Imagine his thoughts today. When I went to college in Philadelphia we read Freya Stark. That was in the 1950’s and yet I still remember her as a vivid writer and an intrepid traveler. She was an inspiration to all of us girls!